Mt Rushmore National Memorial is located in the Black Hills of western South Dakota. The granite protruding from the surrounding Ponderosa pine forest was named in honor of New York lawyer Charles E. Rushmore in 1885. It was named long before its destiny to be the backdrop for a great mountain carving was known. Bill Challis was a local guide escorting Rushmore, who was visiting the Black Hills to check land claims. As the story goes, Rushmore asked Challis the name of a mountain as they passed, and Challis responded that it did not have a name, but from then on it would be called Rushmore. Before it was named Mount Rushmore, it was known to the Lakota Sioux Native Americans as Six Grandfathers. Work began officially on October 4, 1927 and the carving continued until 1941. The sculpture cost a total of $989,992.32 and 400 workers contributed to the carving. More than 450,000 tons of Harney Peak granite was removed during the carving of Mt. Rushmore. More than 90% of the rock was removed using dynamite. Harney Peak granite is found throughout the Black Hills, including the highest summit, Harney Peak. Precise charges of dynamite resulted in the controlled removal of specific amounts of rock. When the bulk of the rock had been removed, only three to six inches remained to reach the final carving. Honeycombing, or drilling numerous holes very close together, was then used to weaken the granite so it could be removed by hand. The final step included the use of a bumper tool to create a smooth surface. Master sculptor Gutzon Borglum wanted the massive carving to represent the meaning of America. 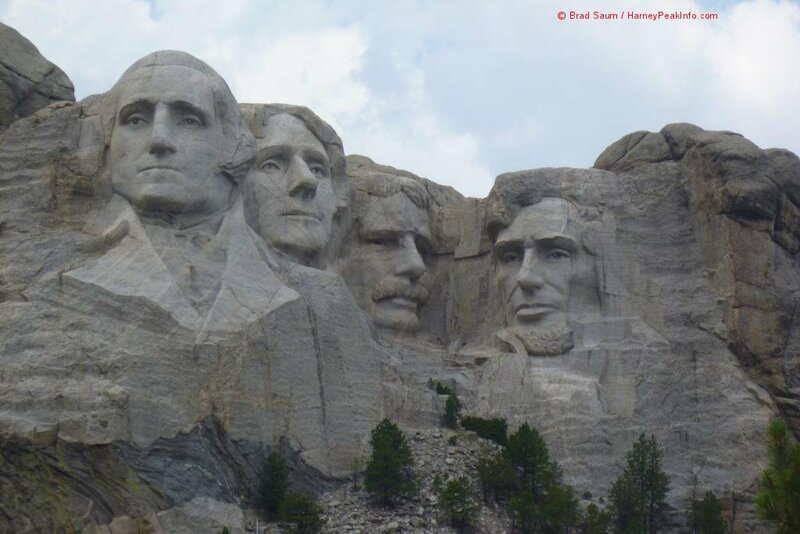 The four presidents were carefully chosen to be part of Mt Rushmore. George Washington represents the birth of the country, Thomas Jefferson the expansion of the nation, Abe Lincoln the preservation of the Union and Theodore Roosevelt represents the development of the country. Mt Rushmore stands as a symbol of the United States and three million visitors descend upon Mt Rushmore each year. Mt Rushmore has been part of the National Park Service since 1933 and although there are no fees to for Mt Rushmore, there is a fee for the adjacent parking area. The facilities at Mt Rushmore include a viewing area, cafe, book store, museums and gift shop. All are centrally located and the typical visitor spends about two hours at the Memorial. From the summit of Harney Peak, the back of Mt Rushmore is visible, revealing what Gutzon Borglum saw when he selected the site for the presidential carving. Entrance sign to Mount Rushmore National Memorial. The granite carved from the mountain remains on the hillside just below the monument. Mount Rushmore and the adjacent parking area. Mount Rushmore and the surrounding Black Hills. George Washington's profile on Mount Rushmore.